Most commercial enterprises who own and use trash compactors are well aware of how difficult it is to keep them clean and serviceable. Maintaining commercial trash compactors require some type of clean up plan to prevent them from leaking pollutants into the storm water catch basins. Sunburst Environmental provides a powerful low cost method for trash compactor cleaning, power washing trash compactor equipment with hot water, while simultaneously capturing all of the used and polluted waste water, and hauling that water away for proper disposal at a state licensed water treatment facility. 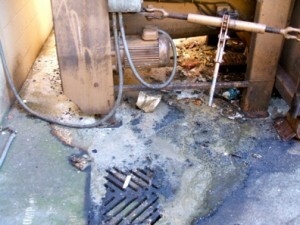 Dirty compactor chutes may contain waste matter, bacteria ridden food remnants, and other toxins. They also provide an ideal nesting place for insects and vermin. 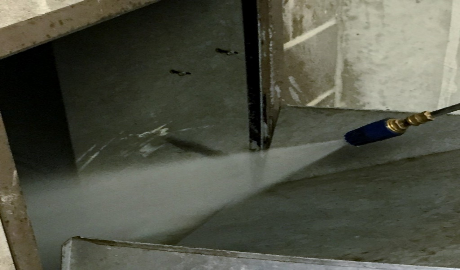 Sunburst Environmental’s method of cleaning and sanitizing commercial trash chutes will rid your building of these problems as well as eliminate the source of unpleasant odors from hallways and basements. 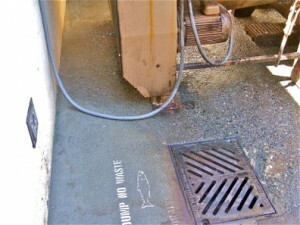 Included in our service is the cleaning of hopper doors and compactors. A final rinse of enzyme and the application of a custom-deodorizing agent complete the process. Sunburst Environmental provides reliable and affordable trash chute cleaning in Atlanta, Alpharetta, Atlanta, Marietta, Kennesaw, Roswell and Woodstock. Please contact us today at 770-226-4786 or cleanit@sunburstev.com for your free consultation or quotation. We are your first choice for commercial property maintenance solutions!